Fall or Autumn marks the beginning of the dreaded budgeting season for many organizations. 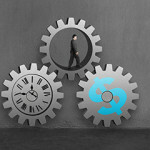 Though we’re still waiting on the final results of our survey with ACCA, preliminary results are revealing that this recurring activity requires organizations to go through a clumsy and imprecise process that has business unit managers guessing at revenue growth, costs, and spending patterns for the next financial year. Savvy business and finance leaders that have gone through this process enough times have grown to be leery of the effectiveness of this activity and weary of the hoops that they have to jump through to perform budget plans. All of this is primarily because of the speed and agility with which business is expected to perform in the current economic climate. More specifically, they are tiring of having to re-jig the original plan every time a business condition emerges that voids original budget assumptions. Rolling budgets are certainly nothing particularly new, yet many businesses continue to be reticent about implementing them. Taking a lead from a recent blog post by Elizabeth Kaigh at APQC, I thought I would consider a few ways to make the annual budget activity more palatable and efficient. Finalize Faster – you will find it is cheaper. Probably one of the most frustrating aspects of the budgeting season is the length of time that it takes to arrive at a final set of numbers and all the dialog that is required between participants to finalized the numbers. 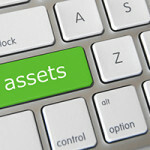 Sending budgeting documents between all the operational and functional departments takes a lot of time and is laborious. The longer the budgeting process, the more participants you need and the higher the cost – this is a fact borne out of the APQC’s 2013 Open Standards benchmarking. Consider using a workflow solution to eliminate the complexity associated with document hand-offs. This could be something as rudimentary as a SharePoint workflow but would be far more elegant if you used a Winshuttle Workflow wrapped around an Excel spreadsheet. This already has a relationship with the numbers due to scripts defined for standard financial and statistical budgeting transactions to both download and upload numbers. SharePoint natively supports excellent document version management even without Winshuttle Workflow. Consider that the difference between top and bottom-performing organizations in cycle time and total costs of planning and budgeting support the recommendation that you move to continuous budgeting. The APQC demonstrates that a significant number of resources have to be taken off “keeping the lights on” work to simply perform the mechanics of the budgeting process. The best way to compress the duration and cycles is to insist on a higher degree of considered precision by those submitting the budget numbers – this doesn’t necessarily mean ‘to the penny’ estimates or forecasting, but may simply mean ensuring that only reviews need to occur based on an exception basis. One of the ways to do this is to insist on some sort of substantiation for numbers that have a >x% factor over the previous year/period – this can all be part of the supporting documentation for the budget submission. Top down budgeting can also help with this approach by insisting that the budget respondents shoe horn their numbers into defined buckets of allocation. 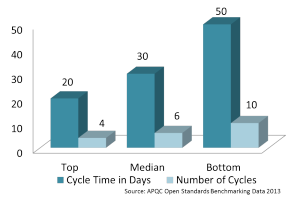 It would be nice to think that you could compress your budgeting cycle into a tight one month period (20 or so working days), but considering this is the brass ring among the respondents to the APQC Open Standards Database, many organizations take longer. Middle tier performers typically took 6 weeks and bottom tier as much as two to two and a half months. Basically an entire quarter. The reason for this slowness in the finalization of the budgets was almost certainly attributable to the fact that it took 10 cycles of budgeting before the numbers were agreed and set. Conversely for top performers, this was compressed to 4 cycles or roughly one budget a week. Consider prescribing no more than 4 cycles of revision. You could argue that taking any longer or any more cycles really demonstrates a lack of commitment to the overall process though in some instances there will be some logistics and technical reasons for why the budgets take longer. More importantly, consider that a long winded budgeting process means you’re wasting resources on those revisions, by the second revision the budget submitter should really understand what the budget approver is expecting for the numbers. Additionally, the more you study and revise the numbers the closer to the bone the numbers may be cut but in reality, if there is volatility in your business then setting a mark in the sand sooner rather than later is always more appropriate – the numbers will likely have to be reconsidered a month or two into the new financial year.